"I have seen what was not meant to be seen. There must be a witness. I shall be the eyes of God in that hell." I thought The Pianist was going to be the last Holocaust movie I'd ever see. Polanski's film was intimate, personal, and powerful�it told the other side of the story depicted in Schindler's List and in countless documentaries. 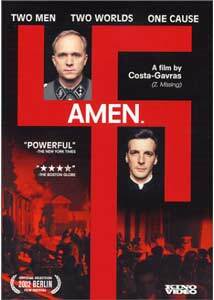 But Costa-Gavras' (Z) little-seen (at least in the US) 2002 film, Amen., took me by surprise. It tells a different sort of Holocaust story, one that focuses not on the victims of Hitler's insane crusade, but on the S.S. men who carried out his wishes, and one who refused to do so. Amen., based on a true story as depicted in the play, The Deputy, by Rolf Hochhuth, tells the story of S.S. Lieutenant Kurt Gerstein (Ulrich Tukur), an expert on fumigation and sanitation whose skill are highly regarded by the Reich. He earns quick promotions, though he isn't sure why�he has been critical of the government for euthanizing "useless" members of German society, including his favorite niece�but he soon finds out. They need his special talents with a certain dangerous gas so they can maximize efficiency, to take care of as many "units" per day as possible. Gerstein, aware that Jews are being shipped to "worker camps," is sickened after touring Triblinka and discovering that 10,000 Jewish "units," including entire families, are being "processed" every day by his special gas. Horrified, Gerstein faces a difficult decision. To betray the S.S. is tantamount to a death sentence, but he can't go on in his work knowing who he is working for, and towards what goal. It is 1943, and he is one of but a few to have seen the death chambers in action, and no one wants to believe what he has to say, certainly not other Germans, who are shown to be, by and large, ordinary people. Gerstein's father (Frederich von Thun), for example, is a proud citizen. He wants to see Germany victorious, and refuses to believe that noble Germans could commit such atrocities. Gerstein takes his story instead to the Catholic Church (who had spoken vehemently against the murder of the "useless" invalid and insane). He talks to young Father Riccardo (Mathieu Kassovitz, who played the photo collector in Am�lie; his character is a composite of many real-life church officials who tried to spread Gerstein's message), whose father is very close to Pope Pius XII (Marcel Iures). The Church, however, does not want to hear what Gerstein and Riccardo have to say, and this inaction on the part of the Vatican forms the crux of Costa-Gavras' narrative. Riccardo repeatedly seeks an audience with the Holy Father, but is rebuked by bishops and magistrates. One tells him simply that the Pope "does not hold Mr. Hitler in high esteem" and that nothing the dictator did would be a surprise, but the Pope still speaks not a word to the faithful. The Church, it is suggested, meant to leave the Nazis be, believing they would take care of Stalin, a true enemy of Catholicism, and then sign a treaty with the Americans. Costa-Gavras' film is, paradoxically, one of the most moving, and one of the most detached and coolly analytical Holocaust films I've seen. Tukur and Kassovitz infuse their roles with passion and anguish, and their performances, and the actions of their characters, are all the more affecting since we know their efforts and sacrifices are in vain�nothing was done about the death camps until near the end of the war. But the events happening around them move forward logically, inexorably, towards an unavoidable conclusion, and Costa-Gavras paints an unemotional picture of the political situation that allowed stubborn men to refuse to see what was right in front of their eyes. This disparate tone results in a schizophrenic, flawed picture that is nevertheless gripping and provocative, giving equal weight to the ethics and inaction of the Vatican, and the story of Gerstein, a faithful Christian who defied his nation to save a people, and his soul. Image Transfer Review: Amen., Kino. This is a wonderful transfer, aside from a few minor sticking points. The image is crystal clear, without intrusive grain or print scratches, and fine detail is excellent throughout. The moody color palette looks rich and natural, and blacks are rock solid. Aliasing is a minor issue throughout, but it's never intrusive. About halfway through the film, though, the picture was disrupted for about a second by digital blocking across the bottom of the image, occupying, I'd say, about a fifth of the screen. I don't know if this was simply an issue with my copy, but it's something to look for. Oddly, Kino has encoded the widescreen mattes (the "black bars") at a much lighter shade than usual�they're closer to gray�and the contrast during darker scenes is very distracting. Audio Transfer Review: Audio is included in the original English DD 2.0. Some might bemoan the lack of a 5.1 mix, but what's included sounds mighty good. Speech is presented clearly, but is sometimes difficult to make out, as much for the actors' thick accents as their modulating volume, but I don't fault the mix. The score and effects are mixed nicely across the front mains, with good stereo separation, and with atmospheric support from the sounds (particularly during a fire scene near the end of the film). There are questions concerning the intended original language. Though it's a French picture with a number of French actors, the DVD is presented in English. I'd heard that the English track was a dub, but it obviously isn't�lip synch is absolutely perfect throughout, and the speech sounds wholly natural. If the film was shown in French in some cinemas, that was likely a dub track (the included documentary confirms that the actors were speaking English on-set). Regardless, Kino has included only the English track, suggesting that this is the one that matters. Extras Review: The chief extra included with this release is a lengthy "making-of" documentary, a 45-minute piece made up of interviews and on-set footage. It's the best kind of feature, free of promotional fluff and filled with interesting information on the genesis of the film. The actors all get their say about the parts they play, and Costa-Gavras talks about his long-time ambition to film the story of Kurt Gerstein. The candid footage is great to see�it seems people goof around even on the set of such a serious film (especially when a Pope costume is thrown into the mix). Kino has included a number of unusual extras in addition to the documentary. The Amen. Pressbook features bios for the cast and crew, information about the real Kurt Gerstein, and a text interview with Costa-Gavras. The interview is lengthy and informative, but also slightly irritating�the interviewer seems to talk twice as much as the director, and his questions read like mini-essays. There is also an interesting comparison between a scene from Amen. and a text excerpt from the original script for the source play, The Deputy, by Rolf Hochhuth. Huchhuth's script was far more critical of the Vatican, and it's interesting to see how much of an impact subtle, minor dialogue changes can have on the tone of a scene. Trailers are included for the feature, Come and See, Love the Hard Way, Chi-Hwa-Son: Painted Fire, Code Unknown, The Piano Teacher, Himalaya, and The Ogre. Chaptering is rather sparse, with only 13 breaks for the two-hour film (oddly, the menu features only 12 selections, but the film is split into 13). No subtitles or captions are included, which is a shame�some of the accents are difficult to decipher. Amen. is an unheralded triumph, an engrossing ethical drama that shines a light into one of the darkest corners of humanity, and finds surprising compassion, grace, and redemption. Even if you think you've seen all the Holocaust movies you can stand, you'd do well to give this one a try. Kino has once again produced a marvelous disc for an obscure�but worthy�film.